We’re all familiar with the cliché “Practice make perfect”, which means frequently doing something makes one better at doing it. 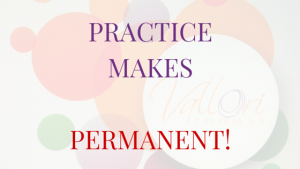 We also know that the more we do something, the more it becomes a habit – which is why I offer “Practice make permanent” rather than “Practice make perfect”. Perfection is the enemy of progress. What is perfect anyway? A solid solution that works, is immeasurably better than a perfect solution yet to be implemented. When you seek out a perfect solution what happens is you by-pass excellence in lieu of perfection. Which can add significant risk to achieving the goal, in terms of time and enthusiasm that can quite often lead to a sizeable amount of procrastination or delay. Save perfect for when it really matters … as in celebrating “perfect moments”. Now I’d love to hear from you. Are you a perfectionist? What do you see being possible if you take ‘perfect’ from the equation and focus on practice?